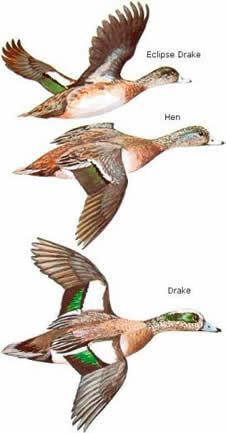 The drake is a very distinct dabbler, with a white forehead and green eye stripe. Their white belly and forewing make them quite showy in flight. Wigeon have an average length of 21 inches and an average weight of 1 3/4 pounds. American wigeon can be found across all 4 flyways. 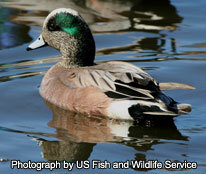 During the winter months wigeon mainly inhabit South Carolina’s Coastal Plain region. Wigeon spend the summer months in shallow, freshwater wetlands including sloughs, ponds, marshes, small lakes, and rivers. Over the winter they are found in areas with large amounts of submergent and emergent vegetation. Examples of winter habitat include marshes, rivers, lakes, impoundments, estuaries, saltwater bays and agricultural areas. Wigeons have more vegetarian tendencies then other dabblers. In the winter months their diet is almost exclusively made up of stems and the leafy parts of aquatic plants, grasses, and crops. During the breeding season they increase their intake of seeds, fruits, insects, and crustaceans. Breeding pairs begin to form before birds reach the wintering grounds and continues on through the winter. Once in the breeding grounds, the female builds her nest in tall grass or brush, often a distance from water. The female creates a slight depression and lines it with dry grass, weed stems, and down before laying 3-12 creamy white eggs. Drakes whistle, and hens have a loud kaow and a lower qua-awk. Nervous birds, quick to take alarm. Flight is fast, irregular, with many twists and turns. When open water is handy, wigeon often raft up offshore until late afternoon. Spend lots of their time on land. Males are territorial during the breeding season. Seldom found in large flocks. May intermingle with small flocks of gadwalls, mallards, American coots, and diving ducks.